When the temperatures dip below freezing, Kat and I always look for teas that are not just warm, but feel cozy and comforting on the inside. Each sip needs to be like wrapping a warm cashmere blanket around your shoulders. Who wouldn’t want to be warm inside and out while the icicles drip and snow falls? Kat has found some zesty teas from Tea India that she started drinking for Diwali and hasn’t stopped since. The delicious flavors are part of Indian cuisine and culture. Spices in the masala chai such as cardamom, ginger, pepper, and cinnamon are perfect for this time of year. They warm the body and wake up the palate. Kat likes to add a touch of sugar and a few drops of milk to round out the chai experience. With added milk and sugar, this tea brings me back to my days of traveling through India with Char. We sampled so many cups of masala chai. Sweet, spicy, and delicious. Everyone had their own unique recipe and it was so much fun to try them all! The Tea India version is a hearty cup that Kat has started enjoying in the mornings, to wake her up and get her ready for a chilly day ahead. The ginger tea is another Indian staple that Kat likes to keep on hand. The zingy flavor is great alone, or with a touch of honey and milk to calm the spice a bit. Ginger is delicious and also good for helping with digestion. Kat loves it as an early-afternoon break as it’s quite reviving! The spicy flavor also goes perfectly with a sweet snack. Cardamom tea is another popular Indian tea flavor. Kat’s friend Sima drinks this tea every day. She says it tastes just like the cardamom chai her mother used to make. Cardamom has a unique flavor that is lovely if you’re looking for an Indian spiced tea but you don’t want anything too spicy. This tea has a pure cardamom flavor without anything but black tea added to it. You can use these teas as they are, or add milk and your favorite sweetener. You can even use the ginger or cardamom as a base and add even more delicious flavors to them. You can find these tasty teas at your local Indian grocery store, or head on over to amazon.com to buy them online. Black Teas to get you through Black Friday! Oh goodness Dearies, I barely see Kat these days! She’s already busy running about getting her holiday prep started. Between Thanksgiving, Hanukkah, and Christmas coming up, she has endless to-do lists. I see her briefly in the morning and then we sometimes meet for a late-night relaxation sip. Watching her breeze around the house for a few days, I decided to come up with a list of black teas to give her a bit of pep to get through the holiday crazy. Especially that Black Friday shopping! She’s planning on getting up very early (even before this tea cup likes to be awake!) and going all day long. Here are a few of our favorite black teas I’m lining up to keep her awake and ready to go! Irish Breakfast- I can’t think of a better way to start the day! This is a super strong blend of black teas, perfect to wake you right up. This tea has a hearty dose of Assam which is malty and bold. It’s a bit stronger in flavor than English Breakfast but they’ll both do the trick. Sometimes they are blended with Kenyan, Ceylon, and Chinese black teas as well. Each blend tastes a bit different so you should try as many brands as you can to see what you like best! Keemun- this is a Chinese tea that’s great for the morning or early afternoon. It can be a little earthy, little bit sweet, with a hint of smoke. Very uplifting and energizing! Darjeeling- perhaps it’s getting a bit later in the day and you want something to get you through but not give you a big boost. A delicate 1st flush Darjeeling is floral yet earthy, a nice balance of more subtle flavors. It will restore your energy and the flavor will also give you focus and calm. Kat has found a new favorite to keep her shopping energy up. I mentioned Tea India teas in our Diwali celebration post, and Kat now keeps the Orange Pekoe tea on hand for moments when she needs a pick-me-up. It’s a bold Assam tea, perfect for mornings or early afternoon. She’s even made it iced a few times, an carries it around in a tumbler. Quite a versatile tea! Earthy, bold and bright, it holds up well both hot and iced. These Black Friday teas are of course great for any occasion. I’d stick with them in the morning or early afternoon if you are sensitive to their pep effects. Do you have a favorite black tea to wake you up and keep you going? Dearies, I was checking out the kitchen calendar and noticed Diwali is Sunday October 30th. Diwali is the Hindu festival of lights. I remember when Char and I were in Malaysia during the festival. It’s such a joyful time of year! Little twinkling lanterns were everywhere and there were the most beautiful firework displays. The lights create such a magical atmosphere! During Diwali clay lamps are lit to symbolize spiritual inner light. In fact, the word Diwali translates to ‘row of lamps’. The holiday marks the last harvest of the year. There are various cultures that celebrate the holiday, and the central meaning is celebrating good triumphing over evil. When Kat was first learning about Diwali, she noticed that there is a theme of gathering together, and celebrating with friends and family. I of course have decided Kat and I need to drink as many Indian teas as possible during the 5 day holiday! My motto is, if there is a crowd, tea must be served! Tea is the perfect accompaniment for the various savories and mithai served throughout the Diwali holiday. I’ve rounded up our stock of Darjeeling, Assam, and Nilgiri teas, and will be brewing up a pot of my masala chai. We also have a few new teas to add to our Diwali preparation list! Just the other day Kat’s friend Sima introduced her to a line of delicious Tea India teas while they were starting to prepare for Diwali. Sima served Kat a few cups while they were applying beautiful henna designs to their hands. I just love how the henna dries into amazing wearable art! The teas they shared combine rich Assam tea with delicious Indian flavors. Kat’s favorite right now is the ginger chai. This time of year she reaches for warming teas and the spicy ginger is the perfect thing. Add a touch of sweeter and this tea is a lovely way to begin your Diwali festivities. The cardamom chai is also in our heavy rotation. The cardamom flavor is perfect alone, or you could add your own spices to personalize the tea even more. Kat has started enjoying the masala chai when she’s craving that sweet and spicy flavor. Brew up a bag, add milk and sweeter of choice for an easy and authentic masala chai. These teas are a great choice for Diwali, and of course any time! They’ve got strong black tea to add a spring to your step, and spicy flavor to enjoy with every sip. You can find these at your local Indian grocer, and head over to amazon.com to purchase them online! While I was learning a little bit about Tea India teas, I noticed they are running a fun contest for Diwali! If you go to the Tea India Facebook page every Friday before Diwali, you can find a beautiful picture to color and submit to win a tea prize pack! I’m heading over there today to see what we can color this week! Kat loves coloring! She has a few different coloring books and often says when she adds in a cup of tea, it’s an incredibly relaxing experience. We are excited to bring on the festivities, food, and sweets of Diwali! Dearies, you know I’ve got the tea ready and waiting. When you gather for your Diwali celebration, what teas will you serve? Dearies, Kat told me that when she was little Char used to assure her that March ‘comes in like a lion, and out like a lamb’. So even though it feels like winter will never loosen its grip, that milder weather is just around the corner. Once the temps begin to rise, Kat likes to switch from warm breakfasts to refreshing smoothies after her early morning yoga classes. What better to celebrate spring than with a vibrant green smoothie? Kat combines green tea, mint, and greens? Brew the green tea and allow to cool (you can do this the night before). You then simply place everything in a blender except for the honey and lemon, blend until smooth. Add honey and lemon to taste. Brew the tea in a cup of water, and allow to cool (again, you can do this the night before). Combine with the other ingredients in a blender until thick and smooth. It’s also easy to make your own smoothies with matcha! In a blender you can combine ½ cup yogurt of choice (lately Kat has been using coconut yogurt which is great for vegans), 2 tbsp honey, 1 tsp of matcha and ½ cup ice. You can also add any fruit or greens of your choice. These smoothies are sure to get you up and out on a gorgeous spring morning! Do you have any go-to tea smoothie recipes? I’d love to swap! The other day Kat told me an interesting story. She was at a grocery store that was sampling iced teas and she decided to give them a try. There was a black, a green, and a white tea to taste. Kat was sipping on the green tea when a young woman approached the table and asked for a ‘regular’ tea, ‘you know, like Lipton’. Kat decided to strike up a conversation with the woman, because before aunt Char opened up the world of tea to her, she only knew teabags from that very brand. She first explained to the woman that the ‘regular’ tea she’s come to know is actually black tea. Kat explain a little bit about how all tea comes from the same plant, camellia sinensis, but depending on location, processing, and plant variety the tea can taste quite different. They sampled the teas at the store and Kat explained a bit more about how the differ. After tasting the black tea, the woman asked Kat what ‘orange pekoe’ is, since she has seen it mentioned on the tea box she has at home. She was confused, since she didn’t taste any orange flavor in the tea. Kat explained that orange pekoe actually has nothing at all to do with the flavor of the tea. It’s part of the grading system for the leaf size. The term originates all the way back to the Dutch East India Company when they were importing teas from Indian to Britain. The exact origin of the word isn’t known, but it has nothing to do with flavor. It just means it is the top tea leaf right before the new bud. The entire leaf grading system is a bit more involved, and you can read a little bit about it here. Dearies, I think I need to write about this in an upcoming post, don’t you? After their tea conversation, Kat guided her new friend to the tea aisle in the grocery store and showed her how many different varieties there were to choose from. Loose leaf and bagged tea, there were black teas, flavored, green, oolong, and white teas to choose from. There was even a matcha to try. Kat encouraged the woman to keep an open mind, and pick up a few new teas to take home. There is much more than one type of bagged tea to try, and the quality can be far better than what she was used to. Dearies, do you have friends that have only had one type of tea, from one brand? Kat likes to hold regular tea parties, and even has an office tea tasting once a month or so. She loves showing her friends there is a wide world of tea out there! She urged her new friend to also seek out grocery stores that cater to different cultures. There is an Indian grocery store not far from where they were, and she suggested a visit. Kat picked up a surprisingly delicious powdered Masala Chai from Tea India there recently and the sweet, spicy flavor has been perfect for afternoon winter warm-ups. Kat was so surprised at how well the blend of ginger, cardamom, cinnamon, and cloves works harmoniously in a powdered mix. She reaches for it every weekend after a chilly day of exploring the outdoors or even after a long day of errands. If you’d like to try this tea for yourself, you can visit the Tea India website here. You can travel the globe with a cup of tea! There is far more to tea than Lipton, indeed. If you’re just starting your tea journey, keep an open mind! Try all the teas you can. Start with your local grocery stores and see what they’ve got. If you have a tea shop in town, be sure to sample as much as possible and become friendly with the staff. Even if you’re not fond of a tea, don’t give up on that type just yet. Try a few different brands and varieties before you totally rule it out. Most importantly, enjoy your tea journey! Kat loves to shop in international grocery stores. She’ll drive for miles just to have the opportunity to roam the aisles and enjoy the colors and aromas of different cultural cuisines. This week she went to a local Indian grocery store and spent a very long time in the tea aisle, of course! She returned home with dried lentils, spices, and a very unique line of teas. 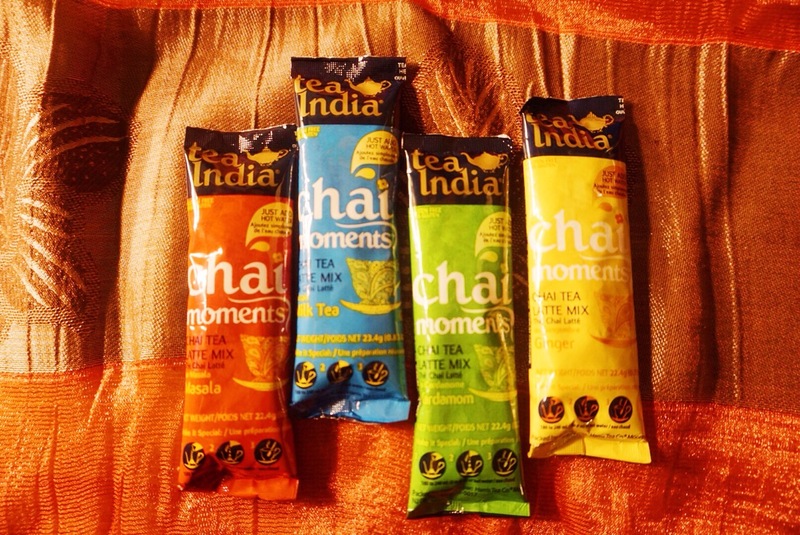 Kat was intrigued by the colorful boxes of teas called Chai Moments from Tea India. She makes her own masala chai at home and loves the flavor, but was curious to see how this tea would compare. These are instant powdered teas, and she wasn’t sure what to expect. Kat was pleasantly surprised to see there are no artificial flavors or preservatives, things that you often find in instant teas. 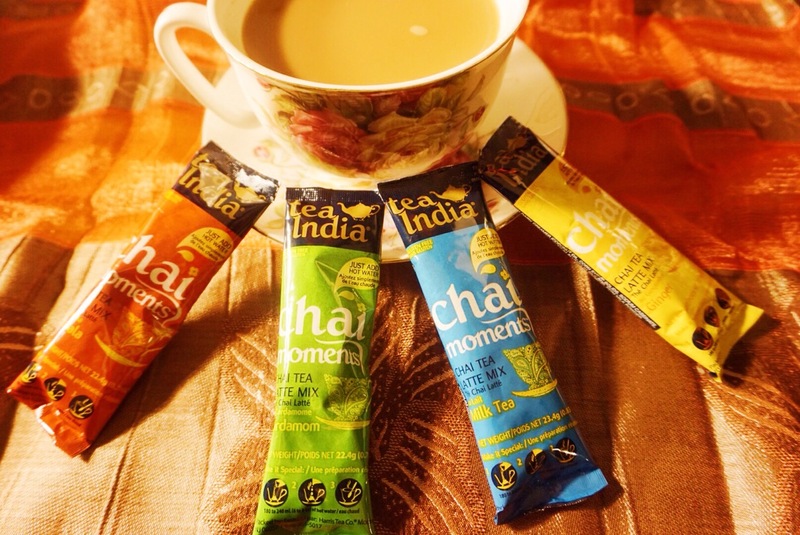 She brought home four different flavors of Chai Moments: Masala Chai, Cardamom, ginger, and milk tea. She invited one of her close friends Sima over for a tasting session. Her friend grew up in India and often talks fondly of having tea with her family. Her mother taught her how to make masala chai and she usually creates it from scratch. To brew up these teas, you simply add a packet to 6-8oz hot water, and stir. The teas are made up of bold black tea, non-dairy creamer, and spices. The first tea they tried was the masala chai. This tea is spicy, sweet, and creamy. Kat said that the blend of cardamom, cinnamon, cloves and ginger took her back to being on the streets of India and sipping masala chai from the chai wallas. I completely agree! As soon as I smelled the tea I could see those chai stalls with the fast moving vendors furiously brewing and pouring tea. This instant tea is perfect for when you crave that spicy chai but don’t have time or teabags available. Kat said she could see herself drinking this in the morning at the office, when she’s looking for a little extra spring in her step. Next up was the ginger tea. This one is warming and spicy. The milk tames the spice a bit, and makes it soothing with a nice lingering zing. Kat said she’s going to reserve this tea for chilly afternoons on the go, when she wants to take a quick break to warm herself inside and out. It turns out that the cardamom tea is Sima’s favorite. She said this tea reminds her of spending mornings with her mother, learning how to make her family’s version of chai. Theirs is heavy on the cardamom, with lots of milk and sweetener. Cardamom in tea can be quite overpowering but this blend has just the right amount. Sima decided she was going to keep a box of this tea at home, for when she wants a taste of her childhood without the time to assemble the tea from scratch. Kat also enjoyed the milk tea, which is creamy, sweet and soothing. Kat is keeping this tea for that mid-afternoon slump when she’s not looking for some extra help to wake up, but without too much spice. This tea is sweet but not too much so. It reminds Kat of being in Taiwan, where she found sweet milk tea everywhere she went. The milk, sugar, and tea are all well balanced in this blend. Each flavor can be tasted, and nothing overpowers. These teas are perfect for travel, outdoor activities, or visiting with family and friends. They are warming, creamy, and oh so comforting! Next time you are in an international grocery store, keep your eyes peeled for new and interesting teas. You never know what you’re going to find!